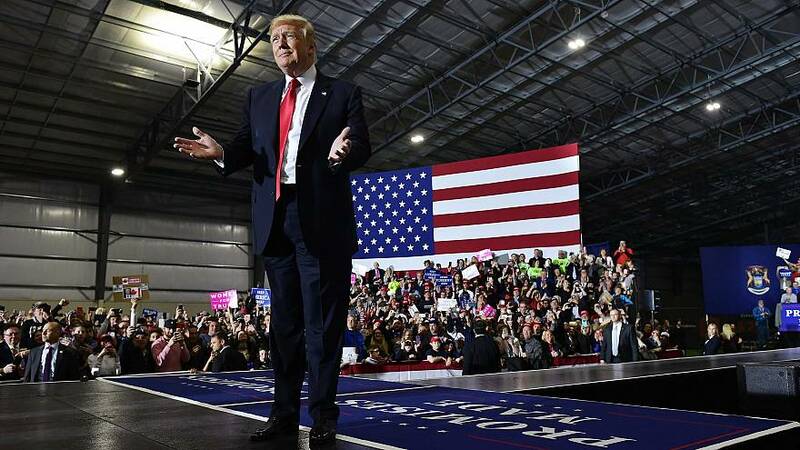 WASHINGTON — It shouldn't be a surprise why President Trump is holding a rally in Michigan tonight. But in last year's midterms, the state reverted back to form — well, sort of. Democrat Gretchen Whitmer won the state's gubernatorial contest by nearly 10 points; Sen. Debbie Stabenow won re-election, though by a smaller 6.5 point margin; and Democrats picked up two House seats in the Wolverine State. On the negative side, however, Trump's political problems in the suburbs — hello, Oakland and Macomb counties — highlight his challenge for 2020. And a differently worded Quinnipiac poll finds 53 percent of national voters saying they definitely wouldn't vote for Trump in 2020. It also shouldn't be a surprise what to expect from Trump's first rally in a battleground state since 2018 (his other rally this year was in El Paso). He's going to spike the football from the summary of the Mueller report - even though Congress and the public hasn't read the full report. On Mueller not making a recommendation on an obstruction-of-justice charge: "It does [surprise me]. The purpose of a special counsel is to make sure the politicals, in this case the attorney general, doesn't make the ultimate call on whether the subject of the investigation, the president of the US should be held criminally liable for activities that were under investigation." On whether the full Mueller report should be made public: "Oh, it has to. It's the bedrock of the Department of Justice, which Bill Barr loves and Bob Mueller loves and I love, is that people have faith and confidence that is not part of a political tribe… And the only way to establish that and to protect that bedrock of their confidence is to show them your work and so we have to see it here." On why Mueller didn't subpoena the president: "I don't know the answer to that. I have the same question about how the Attorney General could resolve the question which he says in his letter turns upon the President's intent without the President having been asked what his intent is." On Trump's admission to Holt — back in 2017 — that he fired Comey due to the Russia investigation: "I thought that's potentially obstruction of justice and I hope somebody is gonna look at that. Again the president appears to be saying, I don't know what's in his head which is why I can't reach the conclusion, what he appears to be saying is." On Trump's claim that this kind of investigation should never happen to another American president: "Close your eyes, again, change the names. Let me make one up for you. The Iranians, this is totally made up, the Iranians interfere in the election to help elect Barack Obama, because they think they'll get a better nuclear deal from him and during that election, an Obama aid meets with the Iranians and talks about the dirt they have that will help Obama get elected." Politico on Cory Booker's CNN town hall last night: "Cory Booker sought to distinguish himself from fellow Democratic White House hopefuls Wednesday, calling for more pragmatic solutions to progressive policy goals and embracing his position as the only African-American male running for president." The Lid: I'm Ron Burgundy…? Don't missthe pod from yesterday, when we looked at new numbers about how the public views local news. The Trump administration is taking more heatfor its opposition to hurricane relief funds for Puerto Rico. The president isn't ruling out a pardonfor Michael Flynn and other aides. Kamala Harrisis landingsignificant endorsements in South Carolina.